Despite a number of preventive measures, the number of dengue cases in the city and some southern provinces remains high with new outbreaks regularly occurring. As of September 20, the city had logged 9,357 dengue patients, an annual rise of 72 percent. Most of the cases were recorded in densely populated areas, and mainly among adults. 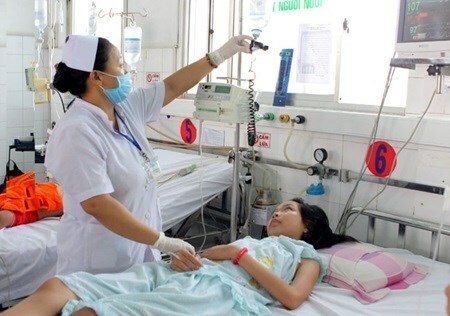 According to Dr Phan Thanh Phuoc, Director of the Preventive Health Centre in District 2 – where the number of dengue patients is increasing, many construction projects are being carried out in the region enabling mosquito development, especially in the rainy season. He cited local lack of awareness of environmental hygiene as one of the culprits in the disease outbreak. A statistic from District 10’s Preventive Health Centre showed that 40-50 percent of local households did not cooperate with health officials in spraying mosquito chemical repellent, causing difficulties in limiting the outbreak. Dr Nguyen Huu Hung, Deputy Director of the municipal Department of Health, said local authorities should apply administrative fines on households not involved in dengue prevention efforts.